It’s time to look at the next Scooby Doo crossover adventure! The gang is back to solve a bunch of cases, but they may need a little extra muscle to back them up this time. The villains are growing more dangerous and most of them don’t even bother with a mask anymore. It’s unfortunate but the Mystery Inc may be out of their depth this time. As always it is a pretty fun assortment of stories. The franchise has always done a pretty good job of being consistent. One of the stories involves the Men in Black (Not literally them but same concept) going after all of the alien superheroes on Earth. This is because the Martian Manhunter delivered a press conference to the world where he said that the aliens were going to take over. That’s when the real one shows up and asks the Mystery gang to help him clear his name. They are happy to do so, but it won’t be as easy as all that. Who can they trust and how can they debunk a television broadcast that everyone saw? There is a bit of a cop out ending to this one, but nonetheless it is a fun story. The stakes probably felt a little higher here than in some of the other stories to be honest. The aliens really needed the help of a good detective and the main characters delivered. Well, most of the detectives did t any rate. This may have been the best story. Then we’ve got an adventure with Zatanna. Her father is missing so she heads to our usual gang of detectives. They aren’t very helpful though and just recommend that she checks with some other magicians instead. They all meet up with a bunch of spellcasters, but they’ve all been robbed of their magical artifacts and are now helpless. Whoever has done this is certainly a big threat, but the heroes won’t give up. It’s a fun enough comic although I have a hard time believing that all of the magicians would get punked so easily. Zatanna’s always a fun character though so it was nice to see her get a story. The Mystery Inc needs to step up their game a bit though because Shaggy and Scooby always make them look so bad. Another comic has the heroes go to a concert where the Infinities are playing. They’re a bunch of teenage superheroes who thought it would be smart to use the same name for both their human activities and super ones. Fortunately nobody has suspected a thing yet. A giant robot attacks along with a bunch of giant monsters so the heroes have to stop them. Thing is, the robot is usually a good guy, but he is being controlled remotely by an evil scientist with a criminally devious master plan. The heroes will have to think of something very quickly but what can they do? It’s a fun comic even if I’m not really familiar with any of the characters here. I didn’t like the giant robot but everyone else seemed mostly reasonable. I don’t think I would like the Infinities much either, but at least they can fight so it was good that they were around. This issue was a little weaker than the others. Then we have a comic where Harley Quinn shows up to join the heroes. Fred and the others are skeptical but allow her to join anyway. It turns out that she is pretty good at the mystery business but the problem is that the Joker is after her. By extension this means that the heroes are also in quite the jam now. Batman is on the way but can they hold out long enough? This comic was fun, but what really took it to the next level was the surprise appearances of Batman and Robin at the end. I definitely wasn’t expecting to see them so that was neat. They do end up stealing the show as you would expect, but that’s par for the course for the Dynamic Duo. Then we have the worst comic of the bunch. The heroes make it to the wild west where they decide to help out a pair of Donkeys. The Donkey sheriff has a secret identity where he puts on a cape and acts as a Zorro impersonation. The costume isn’t downright terrible but you know what the humor style will be like from the start and it never tries to be anything more than that. I couldn’t really get invested in the comic because the guest characters just weren’t interesting. I suppose they tried their best and it still isn’t a bad comic, but it just wasn’t very eventful. Then we also can’t forget the appearance of the Space Ghost. He’s all business as per usual while the kid assistants just get captured a lot. The Space Ghost also look just as frightening on the page as in the universe going by how even Fred and the others seemed a little nervous in his presence. The Space Ghost commands respect after all. The villains know better than to mess with him and that’s why they always go after the kids. The comic isn’t really a mystery so much as it is just a fight against the Space Ghost’s usual villains, but it was definitely a lot of fun. The hero’s design has really aged very well. The art is nice as always. The characters are always on point and it is just very consistent. You will be able to easily fly through the pages on your way to the end. The writing is also on point so you know what you are getting yourself into from the start. If you’re a fan of the Scooby Doo team and their usual antics then you should have absolutely no problem here. If you find them annoying then this won’t change your mind. Honestly, there’s just no saving Scooby and Shaggy at this point since they just aren’t brave enough to hope to stand up to anyone. The team needs to cut them loose. It’s unfortunate of course, but they just don’t add anything to the team. Overall, This was another solid team up volume. It has the right blend of humor and some action that the franchise is know for. If anything, it probably has a little more action than the show would thanks to all of the superheroes running around. There’s nothing particularly unique about the volume as its just another installment that you could interchange with the previous 2, but that’s why you are focusing on the guest stars. Every time a new issue comes out we have a chance at a new guest star. Hopefully we get many more volumes of this series in the future. 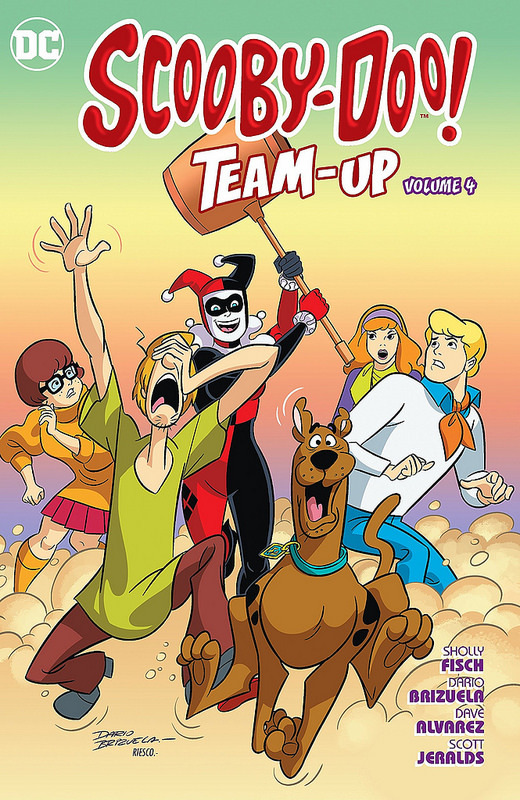 This entry was posted in Comic Reviews, Comics, Reviews and tagged Action, Comedy, Comic Review, Crossover, DC, DC Comics, Guest Stars, Mystery, Review, Scooby Doo, Scooby Doo Team Up by dreager1. Bookmark the permalink.